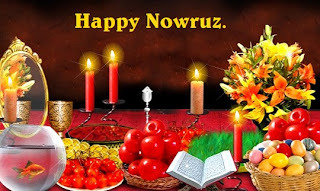 Newroz - "Persian New Year"
Nowruz as celebrated by Parsis. In the Fasli/Bastani variant of the Zoroastrian calendar, Navroz is always the day of the vernal equinox (nominally falling on March 21). The Parsi New Year is celebrated as Jamshed Navroz across the world by the entire Parsi community. The festival falls on the first day of the first month of the Fasli calendar, followed by the Parsis. This falls in the month of March according to the Gregorian calendar. As the day commences with the advent of spring or Vernal Equinox, Jamshed Navroz is celebrated with immense fun and fervor. 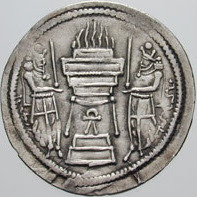 A fire temple in Zoroastrianism is the place of worship for Zoroastrians. Zoroastrians revere fire in any form. When the adherent enters the antechamber before a fire sanctum he or she will offer bone-dry sandalwood (or other sweet smelling wood) to the fire. ***** . New Year (shin-nen, shinnen　新年) .